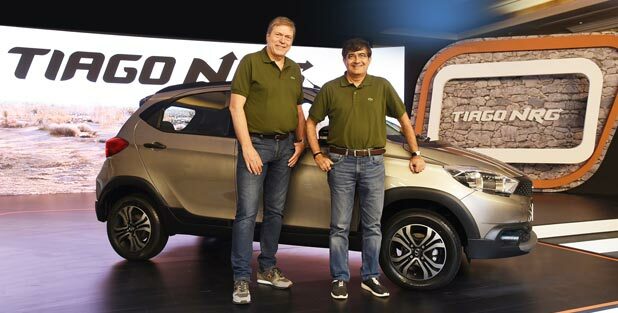 In the image (From L-R) Mr. Guenter Butschek, CEO and MD, Tata Motors and Mr. Mayank Pareek, President – Passengers Vehicle Business Unit, Tata Motors at the launch of The Tiago NRG – the new ‘Urban Toughroader’ from the Company’s passenger vehicle stable. Launched at an introductory price of INR 5.49 Lakhs for the petrol version and INR 6.31 Lakhs for the diesel version (ex- showroom Delhi), this SUV inspired vehicle is targetted at a new segment and is an extension of the much loved Tiago brand. Commenting on the introduction of a yet another class defining product, Mr. Guenter Butschek, CEO and MD, Tata Motors said- In line with our brand promise ‘Connecting Aspirations’, we want to be in sync with the growing trend of bringing to market more SUV like vehicles. To meet this aspiration, we have launched today, the Tiago NRG as our ‘Urban Toughroader’. With this launch, we are extending the Tiago brand and increasing our presence by entering into newer segments and tapping new sets of buyers. This launch is a step towards our Turnaround 2.0 journey, as we continue to focus on ‘winning sustainably’ in the PV business. We are confident that our customers will appreciate the Tiago NRG just like the Tiago hatchback." For more details, please refer to adjoining specification sheet or visit https://www.tatatiago.com/.